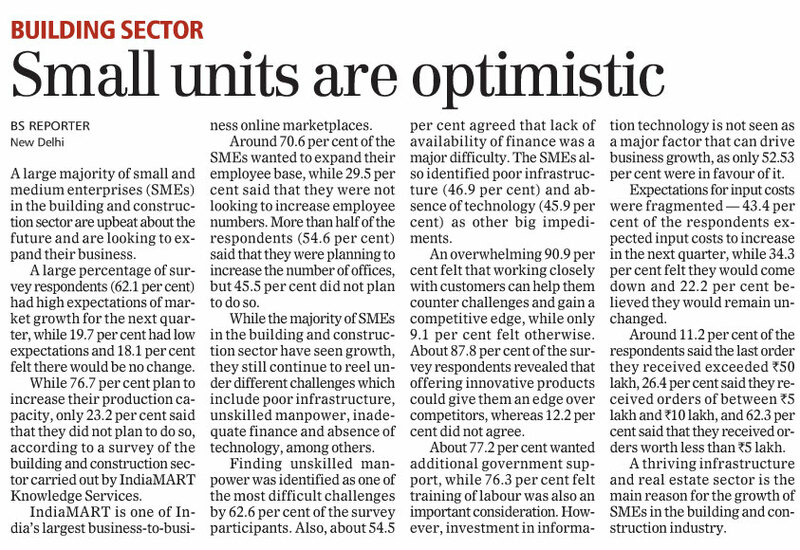 A large majority of small and medium enterprises (SMEs) in the building and construction sector are upbeat about the future and are looking to expand their business. A large percentage of survey respondents (62.1 per cent) had high expectations of market growth for the next quarter, while 19.7 per cent had low expectations and 18.1 per cent felt there would be no change. While 76.7 per cent plan to increase their production capacity, only 23.2 per cent said that they did not plan to do so, according to a survey of the building and construction sector carried out by IndiaMART Knowledge Services. IndiaMART is one of India’s largest business-to-business online marketplaces. Around 70.6 per cent of the SMEs wanted to expand their employee base, while 29.5 per cent said that they were not looking to increase employee numbers. More than half of the respondents (54.6 per cent) said that they were planning to increase the number of offices, but 45.5 per cent did not plan to do so. While the majority of SMEs in the building and construction sector have seen growth, they still continue to reel under different challenges which include poor infrastructure, unskilled manpower, inadequate finance and absence of technology, among others. Finding unskilled manpower was identified as one of the most difficult challenges by 62.6 per cent of the survey participants. Also, about 54.5 per cent agreed that lack of availability of finance was a major difficulty. The SMEs also identified poor infrastructure (46.9 per cent) and absence of technology (45.9 per cent) as other big impediments. An overwhelming 90.9 per cent felt that working closely with customers can help them counter challenges and gain a competitive edge, while only 9.1 per cent felt otherwise. About 87.8 per cent of the survey respondents revealed that offering innovative products could give them an edge over competitors, whereas 12.2 per cent did not agree. About 77.2 per cent wanted additional government support, while 76.3 per cent felt training of labour was also an important consideration. However, investment in information technology is not seen as a major factor that can drive business growth, as only 52.53 per cent were in favour of it. Expectations for input costs were fragmented — 43.4 per cent of the respondents expected input costs to increase in the next quarter, while 34.3 per cent felt they would come down and 22.2 per cent believed they would remain unchanged. Around 11.2 per cent of the respondents said the last order they received exceeded `50 lakh, 26.4 per cent said they received orders of between `5 lakh and `10 lakh, and 62.3 per cent said that they received orders worth less than `5 lakh. A thriving infrastructure and real estate sector is the main reason for the growth of SMEs in the building and construction industry.